The next day I decide to reread what I’d written. You know, to get a running start. I notice some things that need tweaking, so I take a second to fix them. In the process of fixing them, I realize that chapter two doesn’t quite make sense. I go back and … and end day two with a net -2300 words. Yes, minus. In the days that follow, I soldier on. But I keep going backwards, or sideways, writing a lot but making no real progress. Flash ahead a few months. I’m in Salt Lake City at the Superstars Writing Seminar, put on by Kevin J. Anderson and Rebecca Moesta. One day, Kevin does a little segment on productivity. And there it is, the revelation of the century: you can dictate prose! I have the same reaction that many others in the audience have: “That would never work for me.” And yet … it intrigues me. I’m a convert. From a productivity standpoint dictating can’t be beat. And speaking my story gives it energy and helps me capture my true voice. There’s less friction because the story doesn’t have to pass through my fingers on the way out. Make sure your recording device is on and in record mode. Check to see the seconds ticking by. If there is a red light that’s supposed to be on, make sure it’s on. There’s nothing worse than thinking you’ve got a chapter in the can and finding out you’ve got nothing. To get over self-consciousness, dictate where no one can hear you. I like to go for a walk. If it feels silly, make it sillier by doing a funny voice. Don’t worry about grammar, passive voice, dialogue tags, or any other stylistic concern. Just tell the story. You’ll likely be surprised by how readable your dictation turns out to be. Don’t transcribe the recordings yourself. Have your spouse, your aunt or that lady from church who used to be a teacher do it. You can also a hire transcription services on the web. I use wescribeit.com, but I know there are others. Walk while you talk. It’s good exercise and it gives the dictation more energy. Go ahead and make up different voices for your characters. Just make sure your words are clear enough for the transcriptionist to understand. If you’re writing science fiction or fantasy where you have a lot of unusual names, create a document for the transcriptionist to refer to. If you remember, you can spell it out right there on the spot. Don’t listen to the recordings. If you’re outside, consider getting a wearable mic (like a hands free device). Keeping the mic closer to your mouth will provide clearer recording and less background noise. About the Author: Eric is the author of Undermountain, a YA adventure. He’s also a songwriter and guitar player. He lives in Wisconsin with his daughter, wife and his wife’s feeble cat. This is a really interesting idea! I think I’ll try it out, especially because I’m not the fastest typist in the world, and it would be a great way to get my ideas down without having to wait to type them in the “right” words and risk losing them. Thanks so much for the advice! Matthew, I’m glad you were inspired by my post. Dictation may feel a little awkward at first, but it’s easy to give it a try. Most phones have a voice memo option. And you’re right; it’s a great way to get the ideas down. You can tweak all the stylistic stuff in the second draft. I was dictating part of a short story in the car today. It’s amazing how many words you can get “written” in 40 minutes on the freeway. I’ve heard this before and always thought, “Would never work.” Hearing how it worked for someone who had the same gut response makes me want to try. Curious, why do you say to get someone else to transcribe your work? Hi Kathrine — I hope Eric will come back and give you his official answer, but I would imagine that there are a couple of reasons you might want to get someone else to transcribe your work: 1) you receive a more objective take on the recording — if you were DIYing you might feel compelled to edit/change things in the process and 2) to save a bit of time. Thanks for the comment (and question)! Sorry for coming to this very late. The main reason I don’t recommend typing your own transcriptions is because you will almost certainly start editing instead of transcribing. This slows the whole process down. Many people get distracted by their own voice and start getting judgmental about the quality of the dictation. From a productivity standpoint, you obviously save a bunch of time if you aren’t the one doing the typing. I could never afford a transcriptionist. 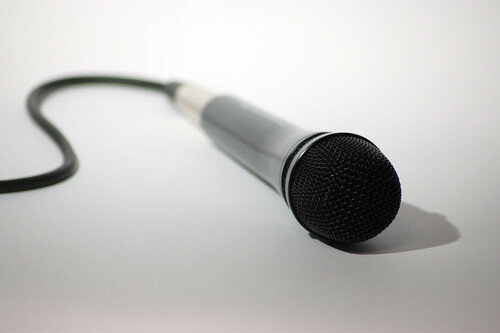 How do voice recognition programs handle prerecorded material? Great question! Granted, my experience with transcription programs is from a copy of Dragon Naturally Speaking like 10 years ago, but I remember it being pretty rusty. Many industries now, however, rely on software like that so I would think the technology has gotten much better. It’s definitely worth a shot — let us know how it works for you! I do occasionally use Dragon for Mac. It’s actually pretty decent, except when it doesn’t recognize all my crazy science fiction/fantasy character names. You can train it, but it takes focussed effort to do it. The big reason for a human transcriptionist is that they can do punctuation, paragraph breaks. With Dragon you have to say the punctuation you want. That said, I was speaking to Rebecca Moesta (who dictates in part for ergonomic issues) about this, and she dictates punctuation even when it goes to a transcriptionist. I’ll also say that I’ve found significantly cheaper transcription sites than the one I mentioned in the post. This is perfect for my commute to school. There’s two hours I can use to “write.” Thanks! This is genius! Doesn’t it sound cool? Let us know how it works out for you! 4-6000 words in a couple of hours? Pretty amazing. The claims I make sound incredible, but it is absolutely true. Of course, it assumes I have a good bullet point outline. I could never get those numbers if I was pantsing! What do you think about the software that transcribes while you talk? I’ve always wanted to try that but I don’t know much about it.